I remember when mainstream tools were first going cordless back in the early 80s. It was exciting to think you could drill a hole or drive a screw without being tethered to a power cord. Then came lithium ion around 2005, and everything pretty much got better, faster, stronger, cheaper, and more flexible. People don’t realize, however, that it was brushless technology that really leapfrogged us into the age of “smart” tools. By using electronically commutated motors, manufacturers now had the ability to control torque and speed (and even clutches) digitally. 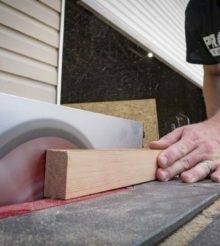 Milwaukee One-Key technology, announced today, but demonstrated at the Milwaukee 2015 media event earlier this year, offers several integrated technologies that takes brushless tools to their logical conclusion. Milwaukee One-Key offers three things: Advanced tool control, job site reporting, and power tool inventory control. We’ll go into all three in greater detail and we’ll also do a full hands-on Milwaukee One-Key review shortly. The first thing that Milwaukee One-Key does is offer advanced digital tool control. I remember one of our media friends asking during last year’s 2014 Milwaukee media event: “So if Milwaukee can digitally control power, torque, speed, and clutch functions—when do we get to tap into those controls ourselves?” A few higher ups looked almost nervously at each other and declined to comment. As it turns out—Milwaukee was already working on this technology. When the tool-control portion of the technology debuts in January 2016, Milwaukee One-Key will provide the ability for users to tap into the tool and customize and configure it for their own particular needs. The One-Key iOS or Android app actually connects to the tool using Bluetooth technology. Once connected you can set up and custom configure the four different tool modes. These are the modes that, previously, simply indicated low, medium, and high speed/torque. Now, you can customize RPM (speed), torque, ramp up time, and whether you use torque control to stop the drill/driver. For example, if you’re fastening into metal you may want to increase the trigger ramp up speed so you help keep the self-tapping screw from wandering on start-up. Or, you can adjust an impact driver’s start, drive, and finish speeds—helping you better protect your fasteners, but giving you the power when you need it. For a drill, you can set the maximum RPM speed for both low speed and high speed. You can even enable kickback control that determines how hard the tool has to bite before kickback protection shuts it down. And Milwaukee says this is just the beginning. One-Key essentially lets users connect to their tool and tie that to a cloud based web of information that is suitable for a single user—or even the manager who wants to manage hundreds of touch points. But, instead of just making a smart Bluetooth battery, Milwaukee “over-invested” in their both their tool electronics and battery electronics, so that they are now positioned to provide tons of services for the Pro user. The tools can be custom configured, allowing users to use pre-determined set-ups for specific fasteners and materials—or even completely customize their own profile with torque and speed settings for the application at hand. At one point I tested a Milwaukee One-Key impact driver on a mockup of a commercial electrical panel. On just this application alone, the customized settings really made a lot of sense. First, the outlet boxes are fastened to steel studs—that requires self tapping screws. Then, the panel itself is anchored to cinder block with Tapcons—another great application. Finally, you’re running conduit, with both MC cable and EMT fastened to steel studs. Previously the plan for manufacturers has been to make a tool that fits the widest audience. Now, that’s being blown out of the water. With Milwaukee On-Key you can dial in a tool to a particular job type. Take the Milwaukee M18 Fuel impact driver. It has three preconfigured speeds—but now you can customize those as needed. The same tool can be configured for use by an electrical, or for use by an MRO professional, or HVAC technician. These tools are smart, and they’re going to make professionals more productive. By allowing custom ramp up, driving, and ramp down speeds as well as torque controls, Milwaukee is all but eliminating the need for you to do much more than pull the trigger to get the job done. Just a couple months after the introduction of Milwaukee One-Key, the company added an update to the One-Key app. The update included Integrated Tool Tracking. This functionality allows you to track your tools by simply pulling out your phone. The Integrated Tool Tracking technology does a couple things: 1) it shows you where (and when) a particular One-Key tool was last seen, and 2) these tool records and locations are updated when a One-Key app comes within 100 feet of a On-Key tool that’s been reported missing. It’s not GPS (the system still uses Bluetooth connectivity to the app), but rather a sort of mesh network, and tools can be tracked even without a battery inserted. Coming in October of 2015, Tool Reporting will be added to the One-Key platform. It will arrive alongside the launch of the Milwaukee M18 Force Logic 6T Utility Crimpers. This technology will give users and job site managers the ability to wirelessly synchronize with a web-based application whereby the user can upload tool data and history to track the success and timing of electrical terminations. The software can work with daily uploads, or even uploads at the end of the week (or at the end of a job—though that’s less helpful). The software can create custom reports that tell you exactly what you need to know and spot potential issues or problems before you leave the job site. The Milwaukee One-Key program will also assist in tracking the utilization and service intervals of the tool to maximize uptime and keep inventory lean. Got a Milwaukee Force Logic tool that was checked out of the crib but not used in the last week or so? Now, you can reclaim it and get it back into rotation instead of having it sit idle at the job site. Inspectors are now requiring confirmation of electrical connections with inspections. This can be a very manual (and honestly a rather vague) process. Milwaukee One-Key can download, pull, and provide reports in seconds that will verify your crimps and connections in a way never before possible. Force Logic registers the date time and the number of cycles the tool reached full pressure. At the same time, a project manager can remotely view the synced information from the job site (with all tools on site checking in). You can even create a custom job report including documenting any incidents. You can also see when tools have been used and which tools are due for maintenance. Currently, tool inventory can exist as a primitive paper-based system, an electronic spreadsheets, or even as a expensive custom software program. Milwaukee One-Key will let you share and update inventory across many levels—and it will do it for free. The desired goal with the development of this software was to help organizations work faster with a higher level of productivity. Milwaukee also designed the software so that it’s suitable for anything from sole proprietors to 1000-employee organizations. Take, for example, a tool like a compressor that isn’t at a job site (but needs to be). The tool crib manager will have to hunt all around and get the tool to the job site. Your entire job could be held up over a $150 tool. Milwaukee thinks this might serve as the “single source of truth” for end users. Taking into account that 75-80% of contractors are 10 men or fewer in size, managing tools becomes a big part of reducing overhead waste. Why hold up a job when you don’t have to? This is the first free piece of mobile software available to end users that targets companies of any size. It shows the tool photo, manufacturer, tool description, model, tool number, and location. It also stores helpful info on the tool like the serial number, category, and purchase information (giving you the “when, where, how much” info you need). It will even access your smart phone’s camera and allow you to store a digital proof of purchase for each of your tools. With Milwaukee On-Key Managed Inventory Software, everything is present in the event of theft or some other event that causes you to need that info to report on the tools. 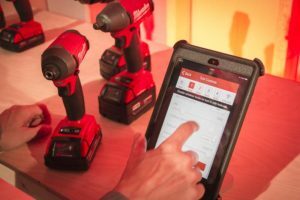 With new Milwaukee tools, One-Key can register a new tool by simply scanning for nearby tools, connecting to them, and automatically registering the tool type, serial number, and model number. You can then give it a tool number and show where you purchased it. You can also upload the receipt which then goes into the cloud. Checking out a tool from the tool crib is easy, and when a job is completed you can mark the tool(s) as returned, missing, or damaged. So what does Milwaukee One-Key technology mean for your company? It means a lot of things—potential things. For one, you can start using the free One-Key Managed Inventory software as early as September 2015 and get accustomed to what it can mean for better tracking of your tools. Next, you can consider what advantages a “smart” tool can mean for productivity on the job site. If you have issues with consistency and repetition or speed, Milwaukee One-Key can really up your game by automating a lot of tool functions that had to be done “by feel” in the past (and some functions that were simply not available without digital control). Milwaukee One-Key tools with tool control will have a modest price premium, but it will be well worth it in production savings and tool flexibility. If you’re a home user, this is likely a novelty, but if you drive fasteners all day, or if you’re managing a team of electricians using utility crimpers, then One-Key has just fundamentally changed your life for the better. As more and more tools become available with Milwaukee One-Key technology, we expect there will be even more reasons to like the customization that this brings to the job site. Geofencing is now in the public beta testing phase of One-Key. Geofencing allows you to set a virtual boundary and the One-Key app will alert you if your One-Key tool strays outside of it. When you use the web app, you’re already set to start using the new function. You’ll need to update the app on your phone or table to see it. Because this is a beta test, Milwaukee is hoping you’ll use it and give them some feedback to make it better. You’ll get a prompt asking for your help with it. There will be more of these tools as time progresses, but here is the current list of Milwaukee One-Key tools as of 3/2016. for the tool tracking to work, do you have to have GPS activated on your phone? How much energy does it drain per day?? Thank your for your posts, I really enjoy reading them! How about integrated leveling. Ya never know how much you appreciate a bubble level on a drill until you use one. Wouldn’t it be neat if you could just lay your phone down next to a place where you are drilling a hole and see if you’re horizontally or vertically true? I wonder if they plan on pushing firmware updates through this system as well. Perhaps it isn’t necessary but I noticed the one screen shot listed the firmware version.